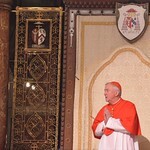 In a homily given at Westminster Cathedral at the blessing of the new decorative scheme of the Chapel of St George and the English Martyrs and the new glass doors in the west porch, Cardinal Vincent said that the martyrs offer ‘a witness that challenges us to assess afresh our own commitment to the faith’. Referring to the reason for their martyrdom at Tyburn, he explained that 'two miles from here and four hundred or so years ago, the truths enshrined in the Catholic faith and the expectations of the state clashed in the most violent of ways'. Speaking of the recently completed glass doors, the Cardinal noted the contrast between the rush and endless noise of Victoria Street and 'the peace and uplifting space which embrace all who enter the cathedral'. 'Their greatest value lies in the fact that their presence allows the great west doors to be stood open more often, inviting the passer-by to pause from their business, put their phone away, and enter into the peace of the cathedral, a space where God has a chance of speaking more insistently than the clamour of a text message,' he said. He expressed the hope that 'many will be attracted to this sacred space, drawn by what they see through the new doors' and 'that the peace and the holiness they find in this house of prayer may encourage them to seek its Source'. The blessing took place after Mass on the Feast of Ss Simon and Jude, 28 October 2016. An article by cathedral architect Michael Drury on the new decorative scheme of the Chapel of St George can be found here. Additional photos of the new decorative scheme of the chapel can be found here.